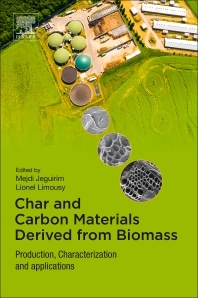 Char and Carbon Materials Derived from Biomass: Production, Characterization and Applications provides an overview of biomass char production methods (pyrolysis, hydrothermal carbonization, etc. ), along with the characterization techniques typically used (Scanning Electronic Microscopy, X-Ray Fluorescence, Nitrogen adsorption, etc.) In addition, the book includes a discussion of the various properties of biomass chars and their suitable recovery processes, concluding with a demonstration of applications. As biomass can be converted to energy, biofuels and bioproducts via thermochemical conversion processes, such as combustion, pyrolysis and gasification, this book is ideal for professionals in energy production and storage fields, as well as professionals in waste treatment, gas treatment, and more. Dr. Mejdi Jeguirim is an Associate Professor at the University of Haute Alsace (France) in the field of energy, process engineering and kinetics modelling. He dedicates most of his career to the biomass valorization through thermochemical conversion and the elaboration of chars with controlled porosity devoted to the treatment of aqueous and gaseous effluents. These research topics were performed in the frame of several international collaborations (Tunisia, Germany, Belgium, Algeria, Lebanon, Greece, Turkey, Cyprus…) and industrial contracts. He acted as PhD advisor for 7 students and he has co-authored more than 50 referred international journal papers in his research field. He is also member of the scientific committee of several international congresses. He is involved as a scientific expert for more than 40 international scientific journals as well as for several national and international research programs (French ANR, Mines Carnot, Research Ministry of Romania, Research Ministry of Kazakhstan). He was the financial and administrative manager of the Energy and HVAC Professional Degree, Specialty: Renewable Energy and Sustainable Development at the Faculty of Science and Technology of Mulhouse from 2007 to 2012. He has received the French National Research Excellence Award for researcher with high level scientific activity for the 2009-2012 and 2013-2016 periods. Dr. Lionel Limousy is an Associate Professor at the Institute of Materials Science of Mulhouse. He received his Ph.D. in Environmental Chemistry from the University of Haute Alsace. He has serves as a guest editor for IJCRE, CR Chimie, ESD, ESPR and Energies and Biofuel. Dr. Limousy’s research interests include Biomass Valorisation; Exhaust gas treatment; Biological wastewater treatment; and Membrane filtration.